The crystalline structure of diamonds and snowflakes gives these disparate materials a similar sparkling look in bright sunlight, and it’s hard to look out across a field of freshly fallen snow without admiring its beauty. Sometimes the spectacular abstraction of the ice and snow is the only charm of a long, icy winter! With natural materials and inspiration that beckon so irresistibly, high-end jewelers brighten up the dark nights by presenting unique pieces that channel the allure of ice and snow without any of their disadvantages or dangers. Renowned Parisian jeweler Boucheron constructed an entire high jewelry collection around the terrible beauty of Russia’s vast, blindingly white landscape. Boucheron was the first French jeweler to open a shop in Moscow, in 1897, and this collection celebrates Boucheron’s special bond with the region. 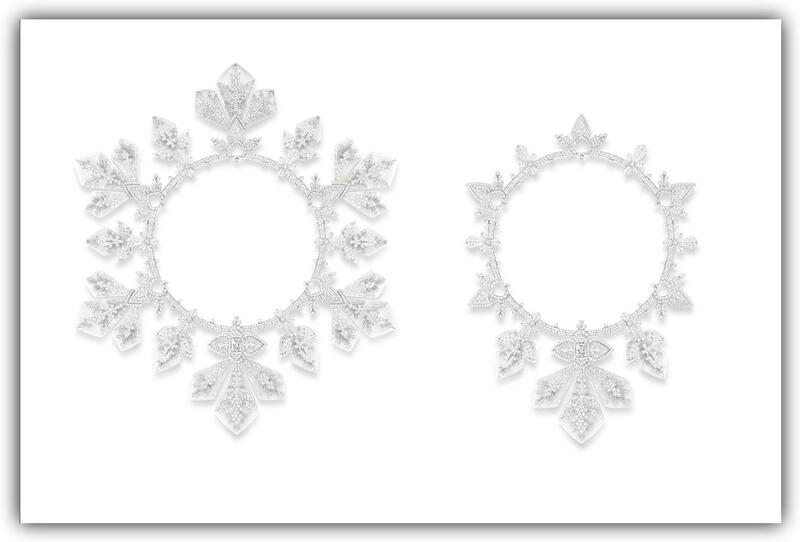 Flocon Impérial is a collection within the collection, an exploration of the aesthetic possibilities inherent to the snowflake, a deceptively simple-looking shape that increases in complexity exponentially as one examines it. The star of the collection is an intricate white gold necklace with detachable elements that can be used in other ways—a ring, hair clips, earrings and brooches, in the tradition of versatile jewelry. Set with diamonds (including one 5.20-carat E VVS1 cushion-cut diamond), and rock crystal, this exceptional necklace captures the thrill and the awe of the polar landscape. 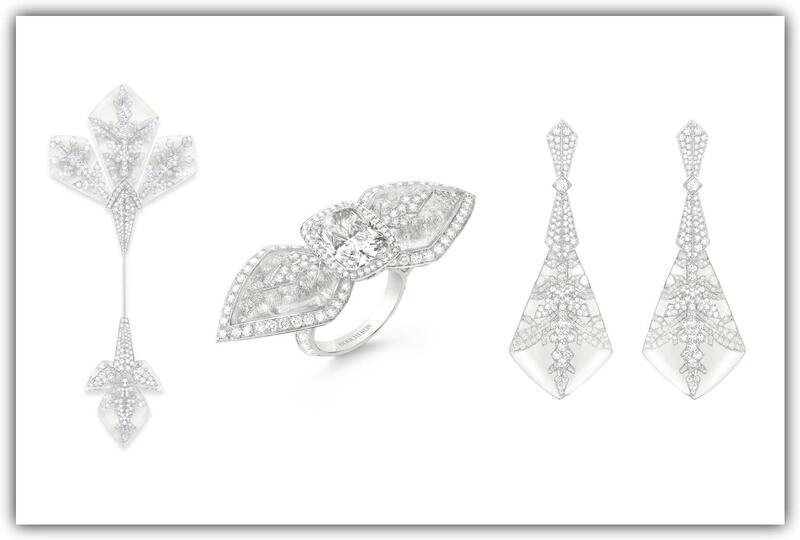 The creative de GRISOGONO reinvented the stone once known as “milky diamonds,” dubbing them “Icy Diamonds” and working with their unique, almost fluorescent qualities, either replacing or complementing the clarity of regular white diamonds with a softer texture and a unique look. 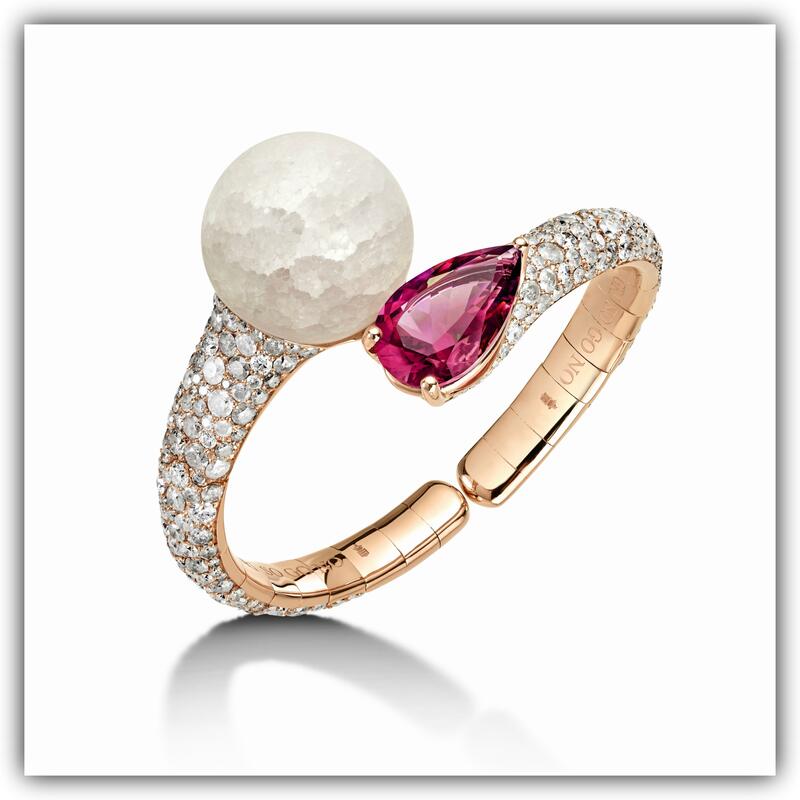 This bracelet from the Boule collection uses not only 266 Icy Diamonds (10.50 carats), punctuated by 37 white diamonds (1.50 carats), but also a compelling cabochon of “frozen” quartz (61.50 carats) that perfectly sets off a pear-shaped rubellite (10.70 carats). The geometric flair of these 18-karat black gold earrings evokes not only the crystalline angularity of an isolated snowflake, but (as you extend your gaze to the perimeter) the swirling, seemingly random paths of falling (and fallen) snow when driven by the wind. Round brilliant-cut diamonds stud the design, bringing both perfect regularity and just the right breath of randomness. The total weight of 17.04 carats speaks to Jacob & Co.’s reputation as a diamantaire par excellence.